Do you feel uncomfortable in crowded situations? Does the thought of mingling in crowds bring you out in a cold sweat? If you are suffering from a Fear of Crowds (demophobia) then, paradoxically, you are not alone. In fact this is quite a common phobia with people who avoid busy shopping centres, theatres, going out with a group of friends, etc. As with all phobias they are completely irrational and the sufferer is usually aware of this fact - however that does not alleviate the feelings of panic that they experience. 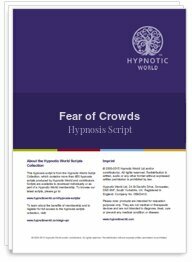 If you or a loved one are suffering from a Fear of Crowds then help is immediately available with this powerful hypnosis script download. Download this script today and very soon you will be enjoying your social interactions with your fellow companions.